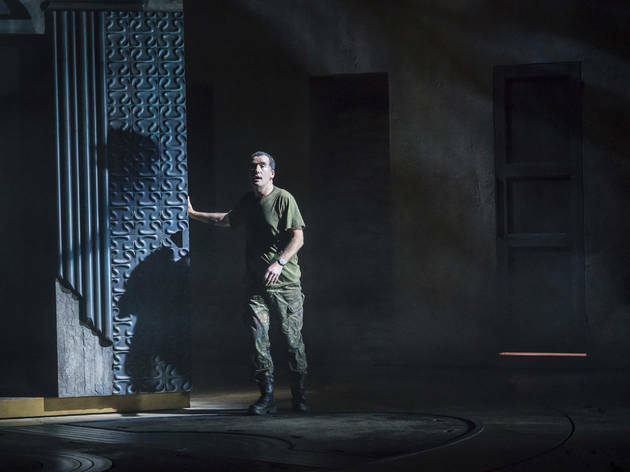 There is a myth that Shakespeare plays pretty much run themselves on the National Theatre’s huge Olivier stage. 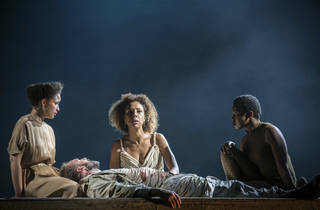 The lie of that was exposed earlier this year, with a dog’s dinner of a ‘Macbeth’ that was so bad it begged the question as to whether the NT might want to rethink its level of commitment to the Bard. Step forward good old Simon Godwin. 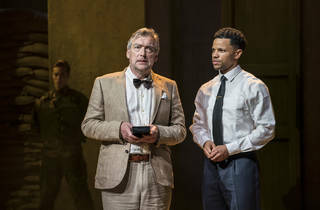 He is not a flashy celebrity director, and I doubt a day of national mourning is likely to be declared when he quietly quits Blighty to head up the Shakespeare Theatre Company in Washington DC next year. 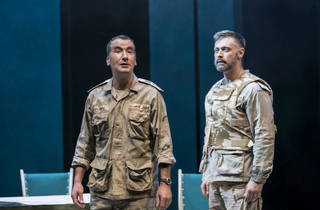 Nonetheless, it will be our loss: he has a gift for making very old, very long plays feel disarmingly fresh, and he concludes this chapter in his NT career with a thoroughly enjoyable take on Shakespeare’s great historical tragedy ‘Antony and Cleopatra’. There are a couple of good ways to really balls up this play. One is to miscast the leads. The other is to freak out in the face of its 37 continent-hopping scenes. Godwin tackles each obstacle nervelessly. 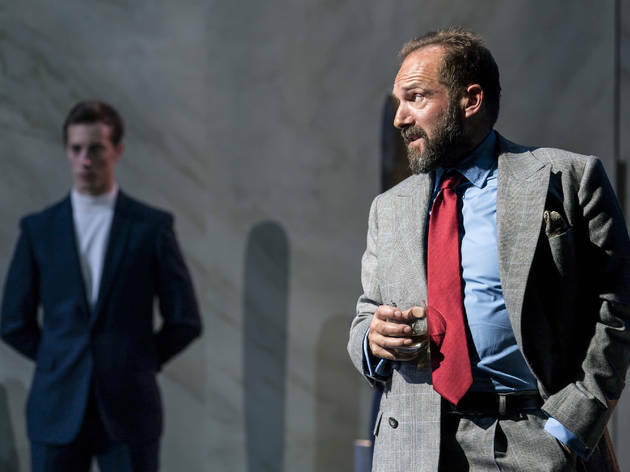 In this he is aided by his regular collaborator Ralph Fiennes, who plays Antony as a boozy old lion, still in the political game through ego as much as ambition. The Roman statesman is clearly a shadow of his glory days, but there is a poignancy in the sense of damage to him. 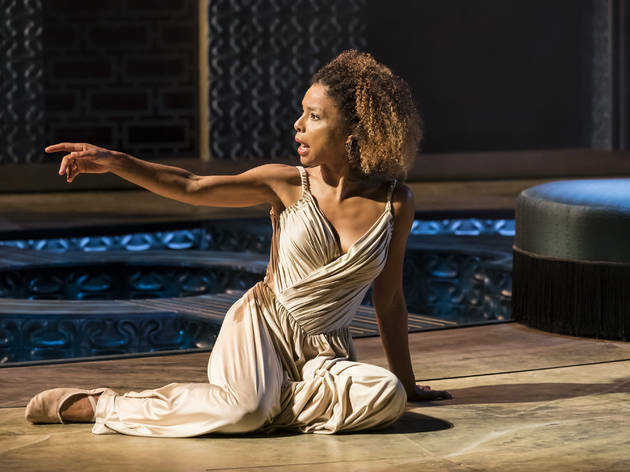 Perhaps Fiennes’s biggest contribution, though, is to swallow his celebrity status and let Sophie Okonedo’s Cleopatra dominate the stage. 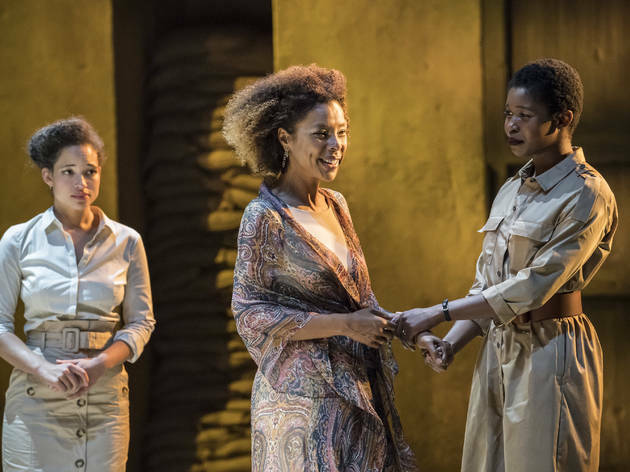 She is an edgy and interesting actor who at first glance seems an odd fit for Cleopatra, traditionally associated with plummy theatre dames and weapons-grade levels of melodrama. 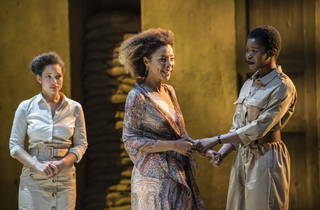 Okonedo is fantastic, though, and quietly subversive: there is a quizzical smirk on her face as she tackles Cleopatra’s numerous hissy fits, which come across as calculated and performative, a big joke. Why? Perhaps for Cleopatra’s own amusement, perhaps as a way of regulating her public image, perhaps to knowingly deconstruct an old-school depiction of feminine hysteria. Whatever the case, she is funny, smart and potent, physically and mentally powerful. 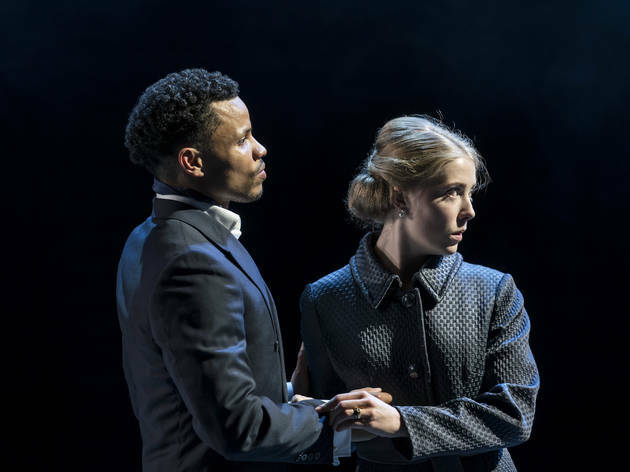 She has some chemistry with Fiennes, but it’s an interesting chemistry – he is using her to escape his past; she is using him to preserve her present. There is love, but it is very complicated – even when they’re together, they are inhabiting two very different worlds. There are a lot of scenes of Roman politicking that have almost nothing to do with the titular love story. The danger of trying to speed through them is that what’s left can feel like dead wood. 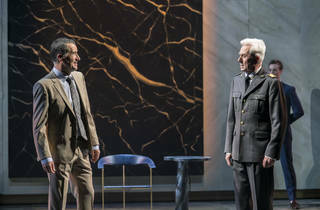 But Godwin’s production luxuriates in the political thriller segments. 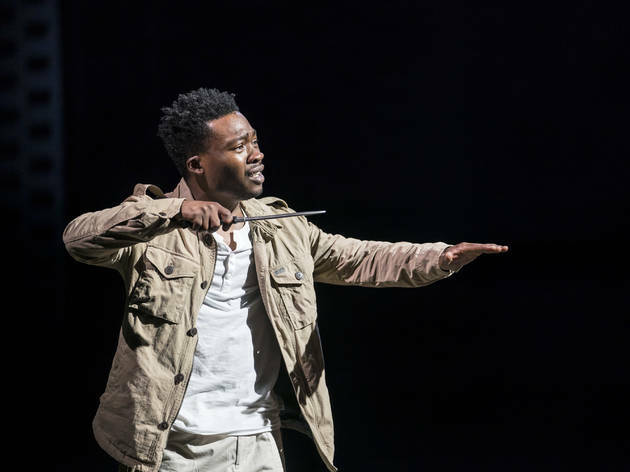 The clash between the old Rome of Antony and the new Rome of Tunji Kasim’s calculating Caesar is developed and explored smartly. 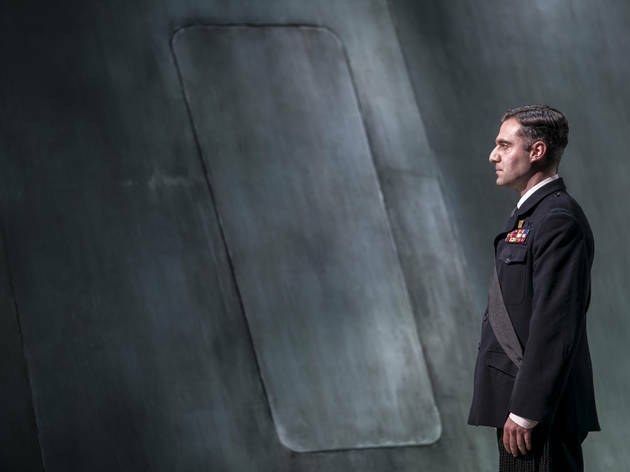 And if you want a sign that Godwin and designer Hildegard Bechtler are taking it seriously, then look no further than Pompey’s flagship – a whacking great submarine that emerges from the heavily – and immaculately – used drum revolve. 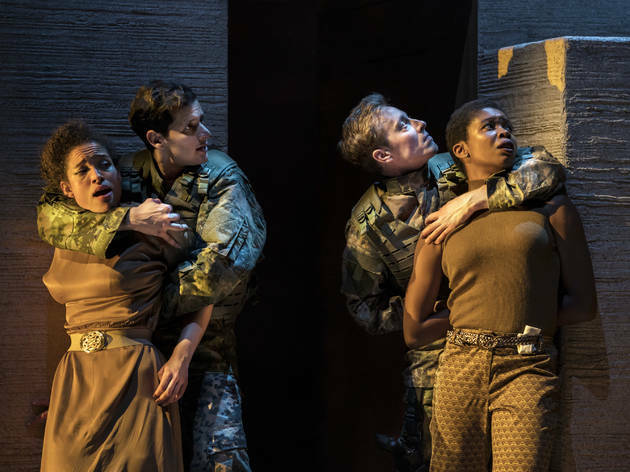 There’s great work all round from Bechtler, who conjures up an austere art deco Rome and a slightly vulgar Egypt – there is an amusingly horrendous water feature in Cleopatra’s palace that is finally used to great comic effect, at the expense of Fisayo Akinade’s brilliantly hapless Eros. 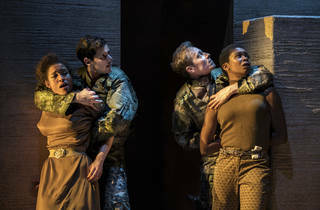 Godwin’s ‘Antony and Cleopatra’ is not particularly revelatory. And the ending is a slight letdown – a few too many jokes amidst the tragedy, while the deployment of an actual snake is pretty distracting (I’m pretty sure it wasn’t actually an asp but some sort of new world snake; perhaps that’s part of the modern dress!). 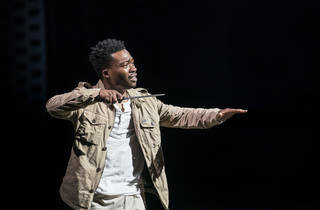 But it is, above all, very entertaining: slick, stylish and action-packed, with a proper marquee performance from Okonedo. 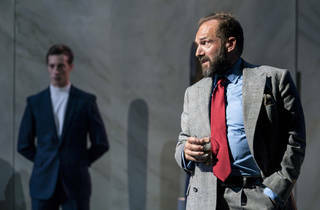 There will always be cooler directors than Simon Godwin: and most of them would have had a nervous breakdown tackling ‘Antony and Cleopatra’. This is a rollicking send-off. 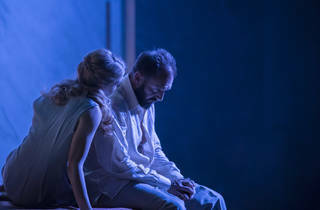 After the debacle that was their recent production of Macbeth, I was really glad to see the National back on form for Anthony and Cleopatra. 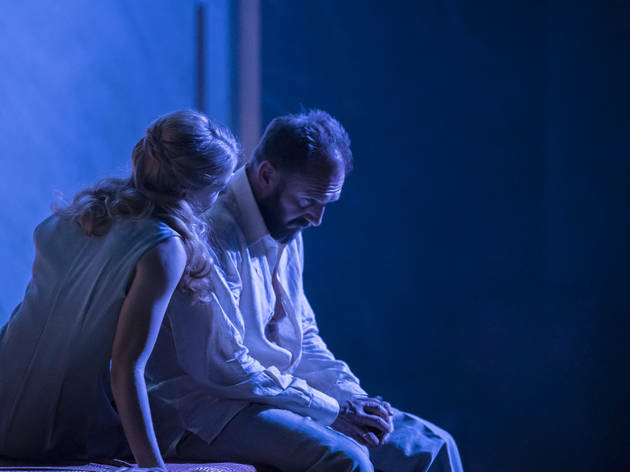 Hildegard Bechtler's sets work on an epic scale, and it takes the talents of Sophie Okonedo and Ralph Fiennes to fill them: they are fabulous! 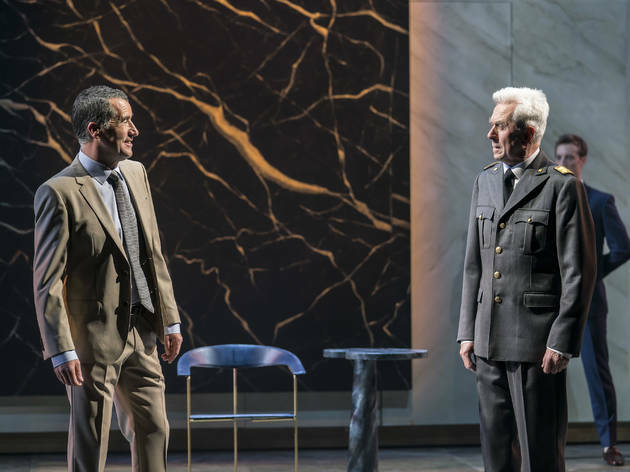 The production is big, and glorious, and opulent, and well worth catching. 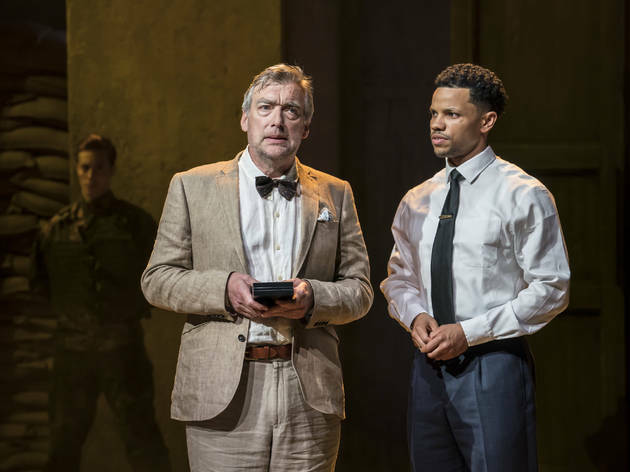 The National Theatre and Shakespeare seems an obvious match and you’d think should be able to work together quite seamlessly. 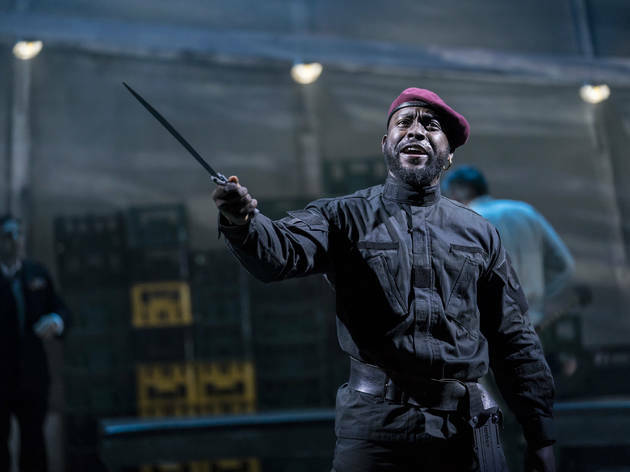 This hasn’t, surprisingly, been the case, Rufus Norris’s production of Macbeth bombed, Twelfth Night the year before was better. 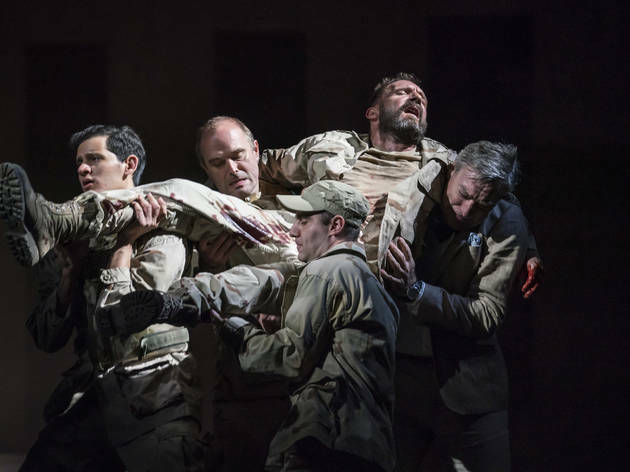 However now they are showing Antony and Cleopatra and the difference between this and the previous two, is non comparable. 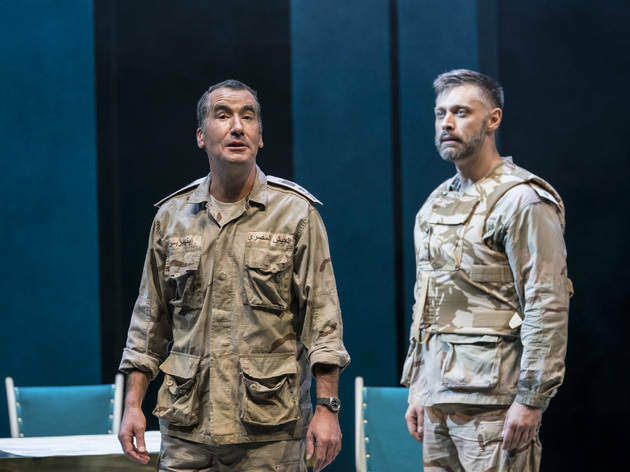 Simon Godwin, was given the mammoth undertaking of directing this beast of a production, and running at around 3 and a half hours, it really is some undertaking. 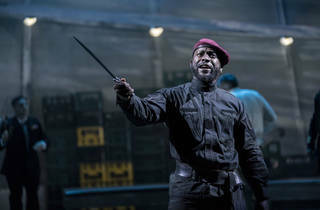 This epic size is reflected throughout the entire production, from top actors Sophie Okonedo and Ralph Fiennes taking the lead roles to the enormous set of Hildegard Bechtler where the hull of a ship leers out from the Olivier Theatre drum revolve. 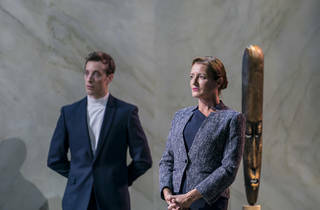 It reminded me somewhat of the whale in the National’s previous production of Pinocchio. It just kept coming and coming, I felt myself leaning back in my seat in anticipation that is may never stop. Simply astounding. 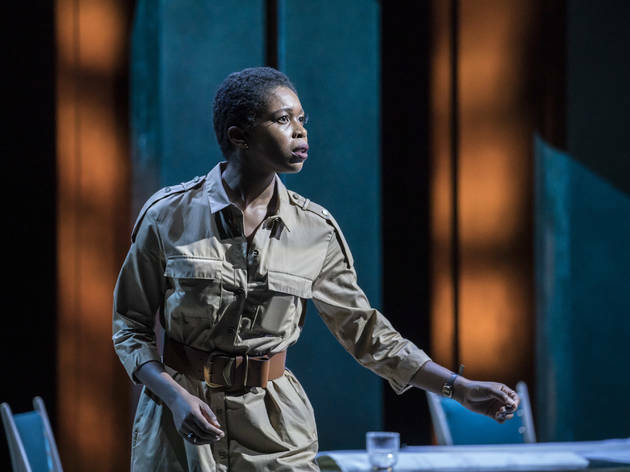 Okonedo is particularly impressive, with her Cleopatra ranging from calm and collected queen to a spoilt diva when she hears of Octavia, to flirty and sexually aware queen who finally gets her man. 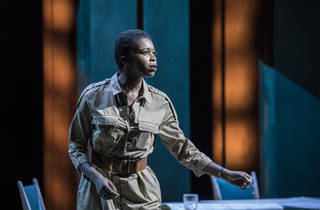 Having never seen Okonedo on stage previously it was a real joy to watch. She was on point. The second act especially demonstrates this and watching her and her ladies pull Antony’s body up to them near the end is pretty funny indeed. 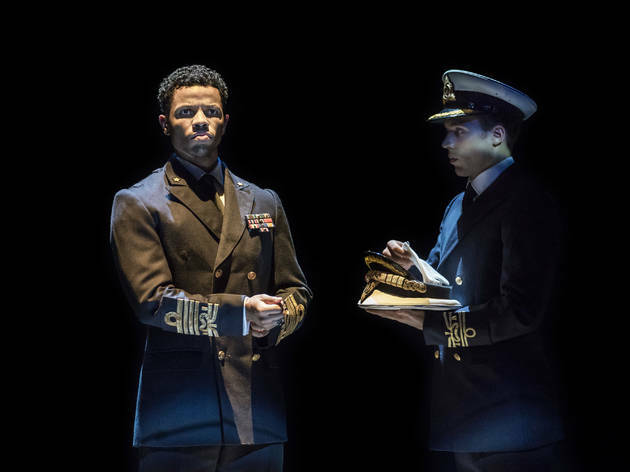 The moments of light-heartedness peppered throughout the production are welcome and seem to make the political and tragic points all the more powerful in that the audience are grounded so forcefully and see that wars and death are just a day in the life of these characters. Godwin is clearly very faithful when it comes to casting. 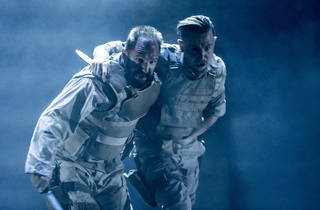 His previous play, Man and Superman, where he worked with Fiennes before, also included Tim McMullan and Nicholas Le Prevost. They may have been good before but McMullan really didn’t hit the mark. I think this could just be me, but I find his choices boring, repetitive and his diction unclear. 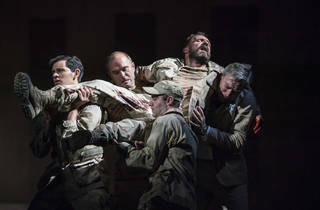 Unfortunately, Le Prevost didn’t have the biggest part in the world, so really wasn’t given much to work with and it was disappointing Fiennes wasn’t completely on his lines, however to see these four (including Godwin) work together again was interesting and something which I’m sure, for better or worse, will be seen at the National in the future. 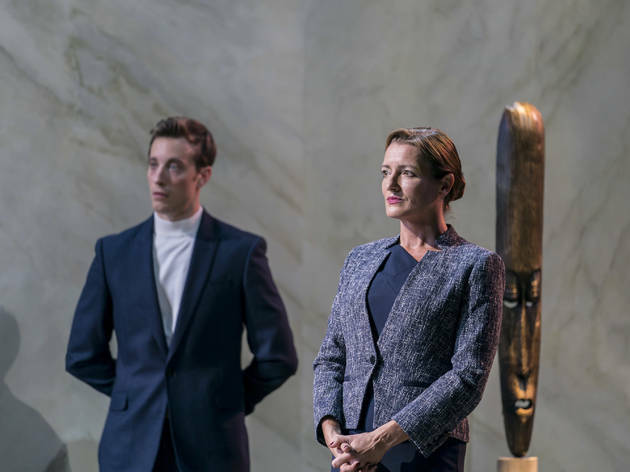 This is a strong production of Antony & Cleopatra. Sophie Okenedo is fantastic as Cleopatra. There is good chemistry between her and Ralph Fiennes as Antony. 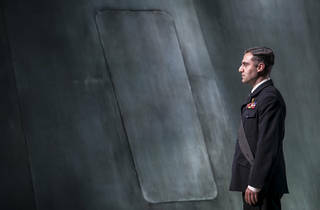 Tim McMullan is excellent as Enobarbus. 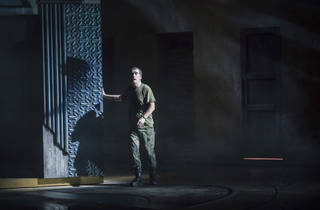 The set is remarkable and versatile. Ophidiophobics beware! 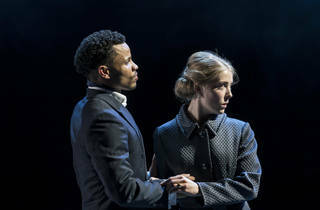 Pleased to welcome a great Shakespeare production at the National. 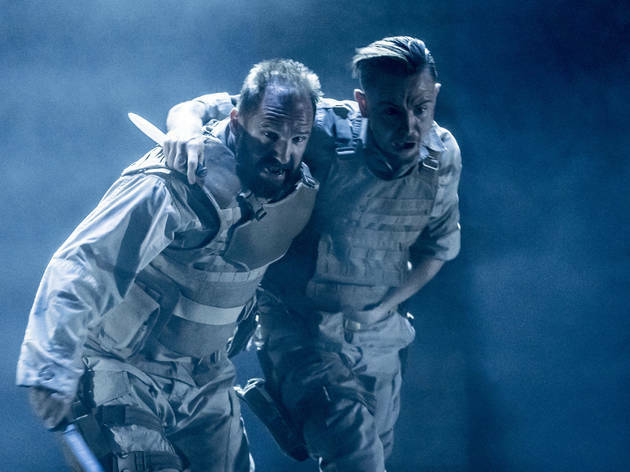 Director Simon Godwin gives us the best new Shakespeare production at the National since his "Twelfth Night". 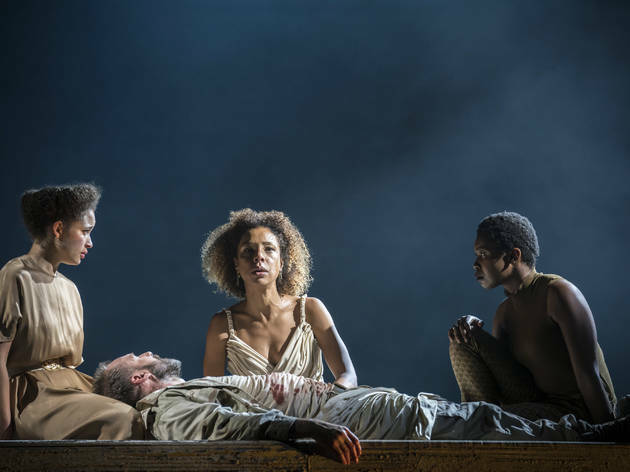 Ralph Fiennes gives a solid performance as Antony, while Sophie Okonedo is sensational as Cleopatra. There is fine support from the supporting cast, especially from Fisayo Akinade & Tim McMullan. Unmissable. 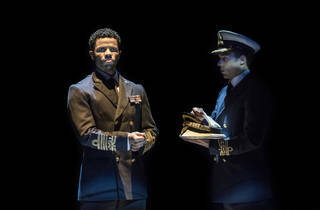 Very good shape for first preview. Fiennes is as good as expected but perhaps a little dour. Death scene very poignant. Won't spoil staging surprises. Maybe a tad long but surely will tighten up. Well deserved standing ovation. This is going to be a smash hit for the Nash. Four stars for now. Needs more pace before interval to nudge it further.